Heat oil in a casserole over medium-high heat. Add chorizo and beef and cook for 6 to 7 minutes until it starts to brown. Make room in the middle, add onion, garlic and bell pepper, and cook for 9 to 10 minutes until vegetables have completely softened, juices have all been absorbed, and meat has browned further. Meanwhile, in a blender, puree orange juice, lime juice, achiote paste, tomato paste, oregano, salt and a cup of the chicken broth, until completely smooth. Pour beer into the casserole with the meat and cook for 4 to 5 minutes, until it starts cooking off. Reduce heat to medium and pour in the achiote paste mixture. Stir and cook for 4 to 5 minutes, until sauce is very thick. Add crushed tomatoes and the rest of the chicken broth, mix very well, reduce heat to lowest possible setting and cover. Cook for 20 minutes, uncover, raise heat to medium heat and cook for 10 more minutes, then turn off heat. Place rack in the middle of the oven. Preheat to 375 degrees Fahrenheit. Cook 1 pound of lasagna noodles in salted water with a splash of olive oil until al dente. Drain. Coat the bottom of a 9x13 baking dish with about one cup of meat sauce. Drape pasta sheets, covering bottom of the pan entirely. Cover with about 1/3 of the remaining sauce, then add 1/3 of the ricotta cheese in dollops all spread out. Cover with more draped pasta, repeat with 1/3 of the sauce and 1/3 of the ricotta cheese. Repeat one more time and add the Edam cheese on top. Lightly cover the pan with aluminum foil and place in the oven for 40 minutes. Remove foil and leave in the oven for another 20 minutes, until cheese is completely melted, crisp and browned and lasagna is completely set. OMG Patty! Watched the show where you made this and I had to have it. Finally made it today and it was fantastic! Thank you! Watch you on Create every weekend…keep up the great work, linda! Happy to hear you had to have it, Linda! Making this for the second Christmas in a row. This is one of my favorite recipes. The beer, lime and orange juice give this dish depth and a robust flavor. You are my family’s absolute favorite chef and your recipes always bring us together. Thank you! Merry Christmas to you and your family! Aww thank you Jenn! say hi to your whole family for me. Just made this tonight for my family. Awesome Patti! We were singing praises to you! Thank you! Oh yay! Thank you Kathleen. Could I make and assemble the lasagna a day ahead and then bake off the next day or would the noodles get mushy? You can for sure make it a day ahead and then bake it the next day. Enjoy the lasagna, Laura! What noodles do you use for this lasagna? They are so large. I saw you cook them so I didn’t think they were the oven ready kind. Thank you Pati, I love your show. Thanks for tuning in, Betty! I used regular lasagna noodles. Pati, Your boys are incredibly blessed, and incredibly lucky that they have a mother that can cook like you. I hope they appreciate it; this is not how most families are configured! Aww thank you so much, Steven. I have to try this!!! Love your show Pati!!! Made this tonight. It was great! The aroma in the kitchen was torture as we waited for the dish to be completed. Interesting choice of edam cheese, but it sure worked. Good one, Pati! The smell is amazing…glad you enjoyed it, Bill. I love watching your show. Your great thank you for all your recipes. I also would like the recipe for you brittle it look so good. Where can I purchase Achiote Paste? Love your enthusiasm and your show, if I can find ingredients. Try your local Latin or international super market…or online. And thank you for tuning in! What a great dish! Love you and your passion for food. Saw you on our food network channel. Just made this for my family in Australia to celebrate Father’s Day. Mixed up the ricotta with chopped frozen spinach and Parmesan to increase the vegetable intake. We now want to learn a lot more about Mexican cuisine! I’m beyond happy to hear that you are excited to learn more about Mexican cooking Caitilin and that you loved the dish! My 7 year old grandson loved this so much he wants him mom to make it for him all the time. Oh my goodness… chorizo in a lasagna yummo!!! I am soo looking forward to trying this. Hope you enjoy it Bec! Thank you Olga, keep an eye out for the season six recipes this fall! Pati, we have no achiote paste in our area so I looked up the ingredient on the website of a large discount department store located in most American cities. There were only three pastes on that website, but they all list ingredients that are written almost identically. The only variation is the word “spices” which could be anything. Is there any difference between brands or is it just the packaging that is different? Do you have a favorite brand? Annatto Seed, spices, Vinegar, Iodized Salt, Water, Granulated Garlic, Cornmeal, FD&C Red Color #40, Sodium Benzoate as a preservative. Annatto Seed, Spices, Vinegar, Iodized Salt, Water, Granulated Garlic, Corn Meal, FD&C Red Color 40, Sodium Benzoate as a Preservative. Ross you should look for one that says Yucatecan or from Yucatan. I hope you enjoy the achiote! 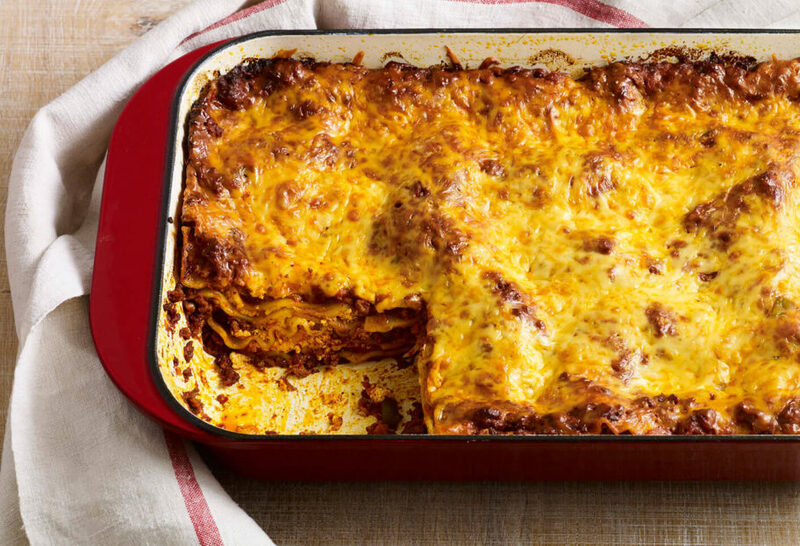 Is it possible if I can substitute instead of a light beer to make Yucatecan Style Lasagna? Claro! You can use wine or if you want no alcohol, try chicken, beef or veggie broth or water. I haven’t made the Yucatecan Style Lasagna as of yet. I haven’t been able to find the endam cheese. I would like to make it on cinco de mayo. Can some one tell me where I can find it or what cheese I can use it it’s place. I am from El Paso, Texas and I was raised on Mexican and soul food. Please help me please find this cheese or tell me a substitute? Gouda is a great substitute, or you can also use munster or monetary jack. Thank you so much concerning the cheese. I didn’t get to make the lasagna for cinco de mayo but I will be leaving my house in a few minutes to go and get that cheese and make it tomorrow for pot luck. Hola, Pati. I made this recipe exactly as written last week and it was fabulous. The leftovers were even better the next day. I added a little chicken broth for moisture and tightly covered it with aluminum foil to reheat in the oven. The recipe prompts an off-topic question about Edam cheese. A couple of months ago we were in Merida, Yucatan where I was served what appeared to be a slice from a round ball of mostly melted Edam filled with some kind of sausage mixture. The ball was sliced into appetizer serving portions with the cheese on the outside and sausage mixture on the inside, and we loved it. Do you have a recipe for something like that? How would you cook it to keep the round shape of the Edam cheese ball and to make sure the sausage is fully cooked? Thank you and viva Pati! Yum! I’m looking forward to it! You wrap the cheese with cheesecloth to make it hold the shape… Then remove it before serving. Hola Pati a mi esposa y yo los encantó esta receta. Randy, thank you for spotting that. It is 2 cups of ricotta cheese in total and then added in layers as the lasagna is built, 1/3 of a cup at a time. Hola Brenda, you can substitute the beer for wine…or beef, chicken, or veggie stock…or even water. When making this and the sauce has too much liquid, does the extra simmering time to reduce the sauce do anything to lessen the flavors? Hi Dave, Actually, simmering longer to reduce the sauce more will only increase the flavor. Go for it! Made this lasagna tonight. It turned out really tasty! Like another commenter, I had way too much liquid and had to simmer it for an extra 1/2 hour+ to thicken, and that was after leaving out 1 cup of the chicken broth. Probably will make the sauce ahead of time the next time, that ate up more time than I expected. So glad you liked it Dave! Hi paty,what moment incorporated of light beer ? Hola Claudia, Once you have cooked the chorizo, beef, and vegetables in the casserole over medium-high heat, you pour the beer into the casserole with the meat and cook for 4 to 5 minutes, until it starts cooking off. Reduce the heat to medium and pour in the achiote paste mixture. We made this today and it was amazing. In our particular case there was way too much liquid. I left it uncovered on the stove for an hour and a half but still had to use a slotted spoon to scoop out the meat mixture. When I make this again I’ll probably use had the amount of broth called for and possibly a second tablespoon of tomato paste. This is a keeper for sure. Oh Elissa, a Peruvian lasagna sounds amazing!! I love what you say about the color of the achiote paste… it is my favorite color, in fact, that is the color of most walls in my house! Good luck with painting this weekend! And I’m so happy to support Monarch Week! Whatever you prefer, I use pork. Oops! That page can’t be found at the link provided about achiote_paste. I am a sucker for Yucatan inspired dishes and this one will not disappoint. I added two bay leaves to the sauce and two Coronas and half a cinnamon stick. I had to spend twice the time to reduce it but muy rico! FIVE MINUTES AFTER WATCHING PATI!! !,…I SHARED WITH MY SON, WHO ALSO LOVES TO COOK AUTHENTIC MEXICAN DISHES? Reading the recipe, I wanted to check about the chorizo. 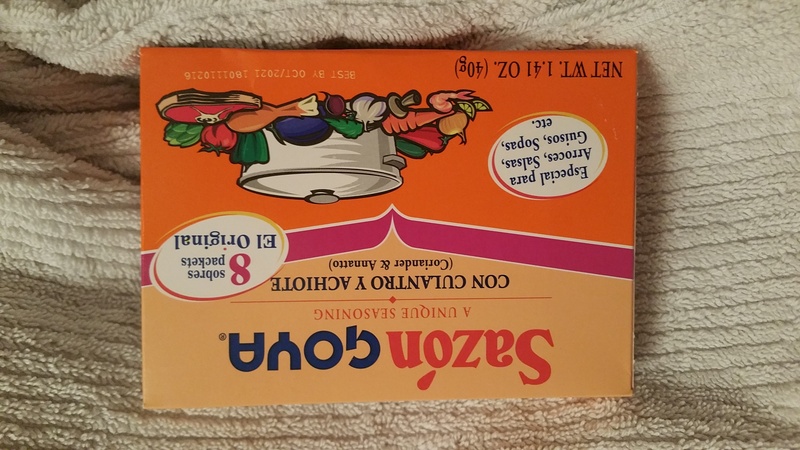 I am used to mexican chorizo being raw, so one would not be able to chop it till cooked, but the instructions have you cooking it. I could see breaking up the chorizo, but not chopping it. Just watched your show, I will definitely make this lasagna tomorrow. Looks amazing. Hola Luis! Thank’s for watching and I hope you like the lasagna! John you want Méxican chorizo not Spanish chorizo. Spanish chorizo is a hard sausage where as Méxican chorizo (sometimes it will be in a casing) but Méxican chorizo has more of the texture of raw hamburger meat and needs to be cooked. Spanish chorizo is more like a hard salami and is already cooked. I hope that helps.